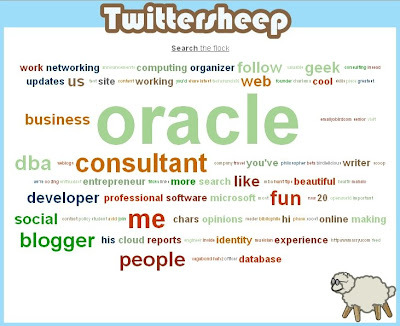 Twitter just keeps on attracting people who glob on new and interesting innovations; the latest I've seen is TwitterSheep which does a neat wordle of your followers. Twitter has got to be the poster-child for YAGNI. By keeping things real minimalist, it not only creates the space but also the yearning for innovation - and we're seeing that in bucketloads (see also MrTweet; proud to say, Singapore compatriots!). Wordles are simple but interesting semantic analysis toys. How useful can a word frequency count be? You may see a bit of noise, but I read them as a measure of obsession. I've been using wordle.net for a while to do proposal analysis. It's become a "must-do" step before submission, as the insights can be invaluable. Simply paste in the full text of your proposal, and reflect on the resulting wordle. It's better than therapy! What should be prominent of course are the concerns and issues that you know your client highly values. But what you will often see in your first drafts are a whole lot of words that are basically synonyms for ME! As in: my company, our product names, our partners, our technology etc etc. All very well (it is a proposal after all), but just like a good conversationalist, shouldn't good proposals be at least equally weighted towards your listener's needs and desires? I think so, and wordles are quick and easy tools for sniffing out the boilerplate proposal that doesn't give a flying fig for the customer! Still not convinced? Well, see the wordles that Billy Cripe did of Obama and McCain's convention speeches. Thank god you voted in Obama is all I can say! What scares me is a seeing an obsession with "Country" "Americans", "fight", "war", "God" and even friggin' "nuclear", "attack" in the one wordle!!!! So here's my twitter flock. Hmm, we're a pretty boring bunch! Props to Daryl Tay for the TwitterSheep link.